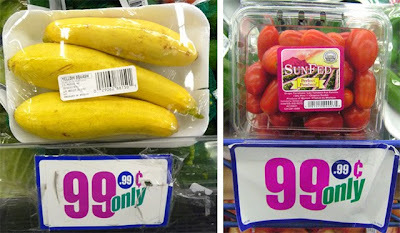 Creatively colorful and flavorful, The 99 Cent Chef combines 3 budget veggies for a healthy side dish. Simply saute and cover for a few minutes, and impress with this bright and tasty display on you dinner table. Crook-neck yellow squash needs no peeling - just chopping; cherry tomatoes are cooked whole; while onions take the most work - oh, come on, a whole chopped onion is easy, too! 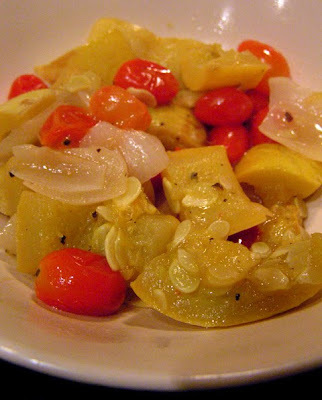 This side is a mix of textures: soft squash, juicy cherry tomatoes that burst when bitten, and tender sweet onions. This dish is a great winter and summer side. 1 carton of cherry tomatoes - or 2 whole tomatoes roughly chopped. 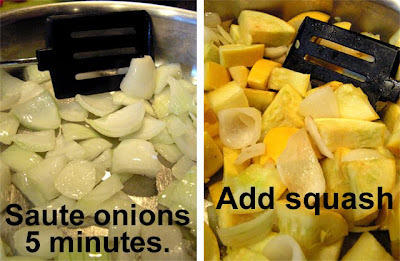 Chop squash and onion into about 1 inch pieces. Add oil and heat pan over medium heat. Saute onions for about 5 minutes until soft. Add chopped squash. Season with salt and pepper. 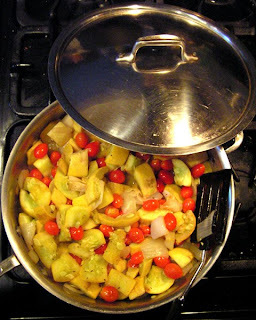 Cover and cook 10 minutes over low heat until squash is tender - easily pierced with a fork or knife. Finally, add whole cherry tomatoes. Mix well and cover, cooking another 5 minutes. 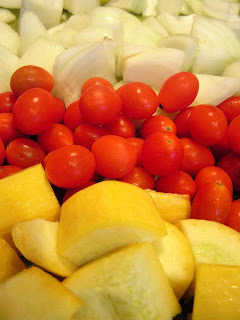 This dish is easy to make into individual servings - just one squash, 1/4 onion, and a few cherry tomatoes per person. 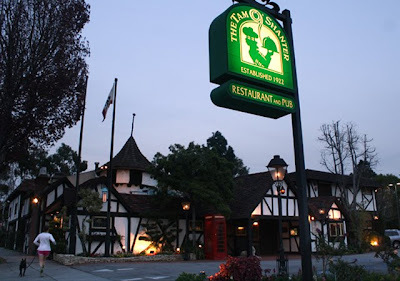 The Tam O'Shanter was built in 1922 in the Tudor style, and became the "unofficial" Disney Studio commissary (the studio was originally down the street on Los Feliz Blvd.). Classic Hollywood talent from John Wayne and Mary Pickford, to silent comic Fatty Arbuckle, were regulars. 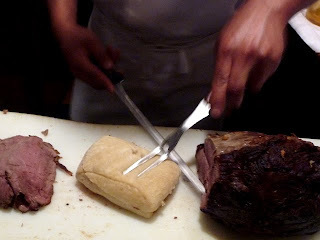 Do order "my dinner of choice" at the Ale & Sandwich Bar: a sliced beef brisket sandwich on a roll, with a large scoop of whipped creamy horseradish, and a side of peanut coleslaw. The moist slow-cooked sliced brisket spills from an over-stuffed sandwich. 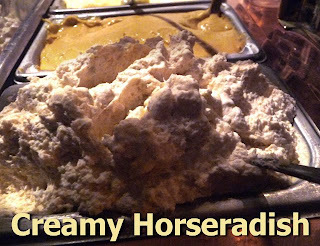 The horseradish is presented folded into whipped cream - rich, sweet and hot. This is the only peanut coleslaw I have ever tried and it is delicious. 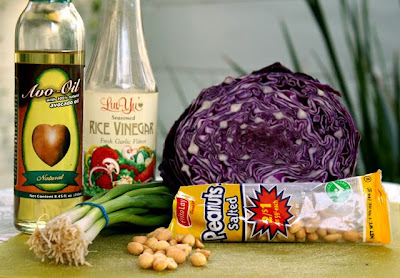 Dressed in oil and vinegar, the addition of regular roasted peanuts adds extra flavor and heft - cabbage, green onion and peanuts are crunchy contrasts. There is also a decent mayo moistened potato salad. The salads and creamy horseradish are self-serve and all-you-can-eat. 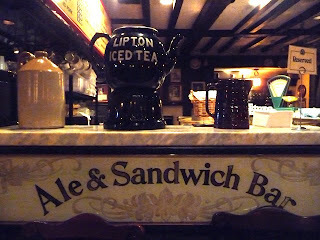 The sandwich with sides are a little steep for this chintzy diner at $11.50, but the uniquely well-preserved setting, and Guinness on tap, adds extra value. As a tasty bonus I recreated the Tam O'Shanter's delicious Peanut Coleslaw Recipe. All the ingredients were bought cheaply - Albertson's grocery, my local liquor store, and the 99c Only Store. 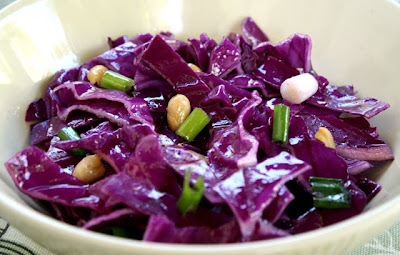 I'm too penny-pinching to exactly replicate their recipe; I use 1/2 head of red cabbage - they use 2 types of cabbage, red and regular (that is a lot of cabbage), but you can use both for a large party. This coleslaw is oil and vinegar based, so I recommend using a tasty vegetable oil like olive or avocado (which was selling at this 99c Only Store). 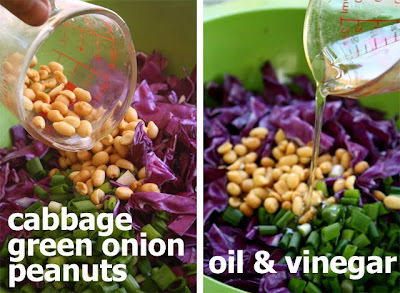 Simple to prepare: just shred cabbage, slice a few green onions, add roasted peanuts (rinsed of salt, and patted dry), then pour in oil and vinegar. Best to let mixture marinate for a half hour before serving. This crunchy side will go with your favorite sandwich, too! 1/2 head red cabbage finely shredded or chopped (thin one inch slices) - OK to use one regular pre-chopped bag of coleslaw -- or combine 1/4 head of red and regular cabbage. 1/2 cup of peanuts - if salted, best to rinse off salt and pat dry. Remove shells and flaky skin if necessary. 2-4 chopped green onions - green stems too, but discard stringy roots. 1/4 cup of vegetable oil - olive, avocado, any tasty type. 2 teaspoons of vinegar - I used rice vinegar, but any kind will do. Salt and black pepper to taste - peanuts add plenty of salt, so just a pinch will do. Chop green onions and finely chop or shred cabbage, or mix in a pre-chopped package of cabbage into a large bowl. 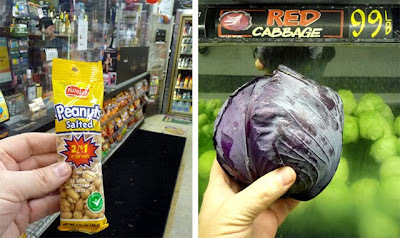 Rinse and pat dry a small package of peanuts and add to chopped cabbage. Season with a little pepper. Whisk together oil and vinegar in a bowl. Pour over coleslaw and mix well. Ready to eat. Serve at room temperature. 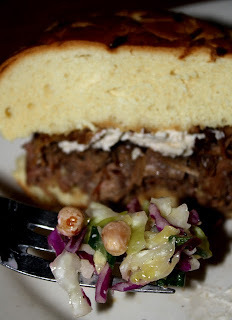 $11.50 for Beef Brisket Sandwich with all-you-can-eat Peanut Coleslaw. Banquet, I'm impressed! 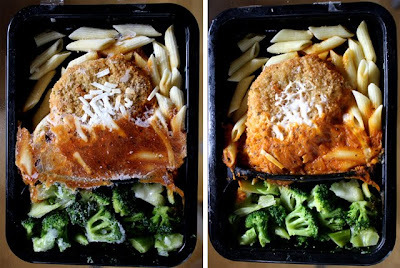 I never thought I would write that, but Banquet's "Select Recipes" frozen entree of Chicken Parmesan & Pasta with Broccoli is satisfying and tasty. I've come to expect artery-clogging frozen fare from Banquet, and have had my fair share. My Banquet guilty pleasure is a micowaved-to-mush Mexican Enchilada entree with watery beans and soggy rice. 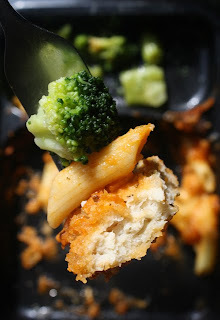 Their Chicken Parmesan meal is not perfect, but the combination of penne pasta in a tasty marinara, whole tender broccoli florets, and a breaded chicken fillet with mozzarella cheese, provides appetizing value for 99 cents. Microwaving the chicken patty steams the bread crumbs, so it loses it's crunchy texture (next time I'll bake it). Microwaving works better on the broccoli and pasta. The marinara sauce is studded with chopped onion and herbs and has real flavor (nice it is not pureed to death), and the penne is tender, not soggy. Broccoli is fresh tasting and the pieces are large with some crunch, I liked it. The weak link is the chicken parmesan patty. It is so thin the bread coating overpowers. There is white meat in there somewhere, I know it. Actually what is there is not bad, over-processed perhaps (hard to tell, it being just a sliver). A smaller and thicker patty would have been better. For a cheap and light meal (for Banquet, at least) I would give their "Select Recipes" other entrees a go (including pot roast and hand-rolled enchiladas). I bought mine at this 99 cent Only Store. 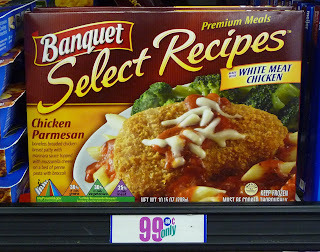 On a scale of 1-9, I give Banquet's Chicken Parmesan a 5. Come ski with The 99 Cent Chef, but make sure you take out life insurance! 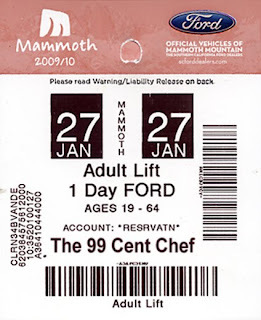 My friend (and 99 Cent Player) Drew has free condo time in BigWood Condos every winter at Mammoth Mountain (in Northern California). And my wife and I were the lucky recipients of a couple of free days last month. I am not a good skier (I stay on the easy green diamond runs), but this year I tackled a black double-diamond run called Huevos Grande (Big Balls). 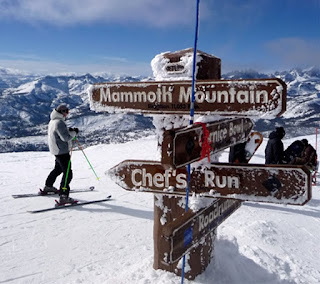 At the top of Mammoth Mountain the view is breath-taking, but the ride down is heart-attacking! 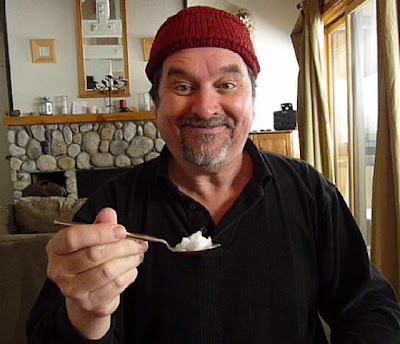 Warning -- take 2 dramamines before you view my ski video! Along with beautiful mountain views, The Chef gives you the lowdown on a great happy hour that starts when the ski lifts shut down. Whiskey Creek is a bistro with a Happy Hour you can park your ski-weary ankles in. It runs from 4 - 5:30 p.m., and the whole menu is 50% off ! The place was packed on a Thursday, but we quickly found seats at the bar. I had the "Classic Sliders": 3 plump medium-rare mini-burgers topped with sweet caramelized onion and sharp cheddar cheese, for about $5.50, a delicious deal. My wife had Fish Tacos - you get four, but they were too breaded; I would give them a pass next time. Beer from Mammoth Brewery is on tap and at a discount price. I got it everywhere in town, including a deli that had wi-fi for my photo-tweeting. 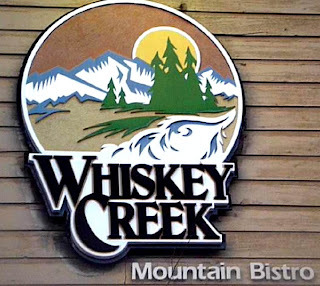 For an uncrowded Whiskey Creek experience, stop at the second location in Bishop, just south of Mammoth. Now, I am called The 99 Cent Chef for a reason, and my "Breakfast in Mammoth" scene shows the cheapest meal I have come up with yet. For all you weight-watchers, my "snow white" breakfast is also low in calories. I give a big thanks to Southern California's Ford Dealers for a free day of skiing! My wife and I took advantage of their offer: a free lift ticket (87 dollar value) when you test drive one of their cars. It only took 15 minutes; just give them your email address to receive a confirmation number. It is a great, free, no-hassle deal! I think the promotion ended a couple of days after we did our test drive. Jump on this deal next year! There was a fresh dusting of snow in our local mountains yesterday, so my new video may motivate you to hit the slopes this weekend. Even if you have never skied before, you are in for a thrilling video ride. So strap yourself into your computer chair, grab a hot mug of chocolate (or a flask of bourbon) and check out my Mammoth Ski Vacation video, shot in wide screen ChefScope! Play it here. The video runs 5 minutes, 33 seconds. Click here to view or embed from youtube. 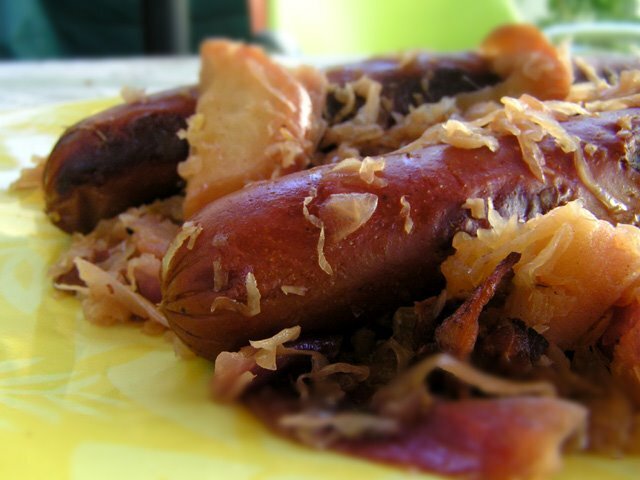 Sausage and sauerkraut are made for each other and the Chef will use any excuse to cook with beer. And you can be sure there will be no leftovers with this recipe! All the ingredients are cheap, the way The Chef likes it. This dish is traditionally made with bratwurst - I substitute inexpensive Polish sausage from this 99c only Store - they always stock it. 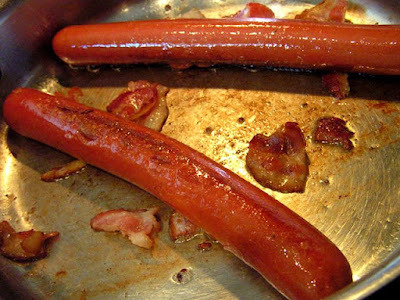 Of course, my readers living high-on-the-hog can use any gourmet hand-crafted sausage they like! As for sauerkraut, it is one cheap canned/jar veggie. Other budget ingredients include one onion, one apple and a 24 oz. can of beer, bought on sale from my local liquor store - only 12 ounces are needed so the leftover elixir will sustain the Chef through the duration of cooking. Sauteed onion with the addition of an apple brings sour sauerkraut into a sweeter flavor profile. One last ingredient is a couple slices of browned bacon -- and you know how everything is good with bacon. 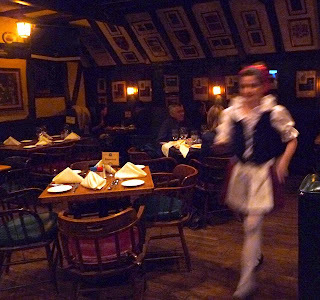 I first had sauerkraut on a hotdog, but learned more complex versions when I filmed in Hollywood and lunched on Melrose Avenue, just past the Paramount Studios lot, at a German Hofbrau restaurant (long gone, but not forgotten). One of the attractions was the constant hiring of fresh-faced frauleins from Germany who worked as waitresses. I'm not sure why, but they were usually quite curt and no-nonsense, although always cute in their Hofbrau-style frocks, snaking through tables laden with trays of smoked pork chops, bratwurst, German potatoes, sauerkraut and decorative steins of frothy pilsener. The lads in the film-crew loved this place. Frauleins and steins, Prost! I has always had a fondness for German culture including: German Expressionist art, the tragi/comedy musicals of Bertolt Brecht and Kurt Weill, and the cinema of Rainer Werner Fassbinder -- a difficult artist and not everyone's cup-of-tea, or stein-of-beer. The Chef's Sausage & Sauerkraut With Beer is a slow-cooked hearty entree you can hoist a foamy filled stein of hefeweizen to. Guten Appetit! 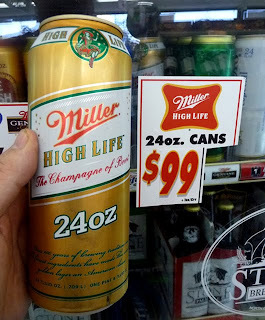 1 12 oz. can of beer - light or dark - photo shows 24 oz., half went into marinating the Chef. 14 oz. sauerkraut, drained - sauerkraut is so tasty prepared this way that you may want to add an extra can. Pepper to taste - bacon and sauerkraut has plenty of salt. Brown bacon and sausage together about 10 minutes in a large pan or pot. Add sliced onion and cook to soften, about 5 minutes. Add 12 ounces of beer and deglaze the pan. Bring to a boil, then reduce heat to low. Drain sauerkraut and add to sausage and onions. Lastly, core and slice one apple, mixing into sauerkraut. Cover and cook for about one hour over low heat. Check and add beer, water or stock a half cup at a time, if liquid evaporates. The song "The Ballad of Mack the Knife" is sung by Louis Armstrong. Lyrics & Music by Bertolt Brecht and Kurt Weill from the play "Three Penny Opera". Movie clip from "Lola" by Rainer Werner Fassbinder.